The warming weather, longer daylight hours, the blossoming earth all hearken the turn of the great earth wheel once again. Beltane, one of the high Celtic holy days, has arrived. Traditionally celebrated with wild romps in the woods and dancing around the Maypole the following day. 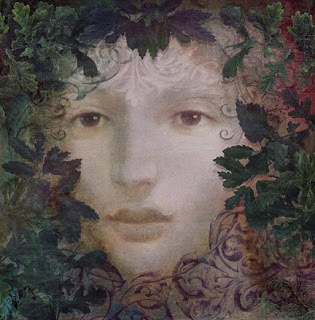 Beltane, also spelled as Beltaine, has very powerful and complex energetics related to it. For me, it is one of my favorites of the Celt festivals. Appropriately for Illuminated Perfume the holy day marks the beginning of the light in this portion of the great wheel. Boughs and flowers are gathered on the eve before for decoration in honor of the Sun. Cakes and milk is offered to the spirits, standing stones are visited and gentlefolk decorate themselves with garlands, flowers and greenery. The Maypole, masculine energy, is planted into the Earth, feminine energy. Symbolically this represents the movement of energy descending down from Father Sky to meet Mother Earth and bless the land for abundant crops. Two of my teachers, David Crow and Dr. Stephen Johnson, speak of dancing as acupuncture for Mother Earth. I can see clearly how dancing around the Maypole on a high holiday, when the veil between the worlds is thin, would be potent medicine for both Earth and dancer. Throughout Druidic lore we find the elementals to be at the core of the mythology. Beltane is one of the four "fire" festivals. Fire acting as the primordial source of Life. Water is the second element to be honored for the much needed rainfall assuring abundant crops. In composing a botanical/natural perfume for Beltane I start with a wood chord/accord for the Maypole. Continuing with Mitti for the Earth, Black Pepper for the Fire, and Jasmine for Water. I add spiritual essences which combine attributes of purification, protection and psychic powers. Tinctures or essences of flowers, berries, leaves and stems are all appropriate for the blooming of the land. In few years back for Beltane I created the perfume "Q" (for Quercus agrifolia) in honor of the Oak. In the Celtic tree calendar May is devoted to Duir, Oak. This perfume continues to be a favorite, especially for those devoted to pagan traditions and fairy kin. 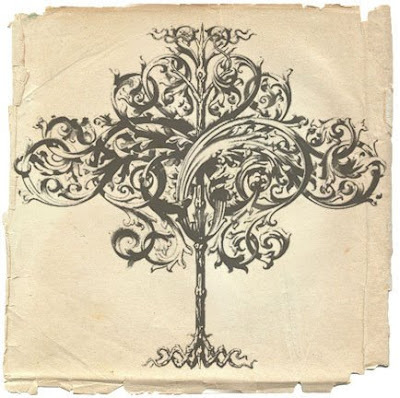 The image at top is titled MayTree ©Roxana Villa & Greg Spalenka, created from an old engraving. 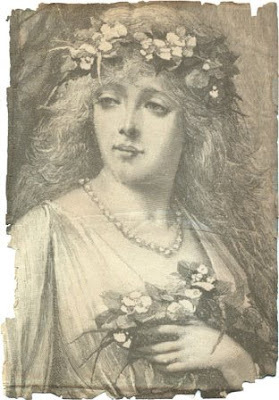 The image of the young lady in the garland is an old engraving placed on parchment. The image at bottom right is ©Greg Spalenka & Roxana Villa, it was created specifically for the "Q" perfume. wonderful beautiful work, fabulous images and artwork.